Atom is the smallest particle of matter. It consist of three particles, called proton, electron and neutron. Protons and neutrons are placed at the center of the atom and electrons are placed around the center. 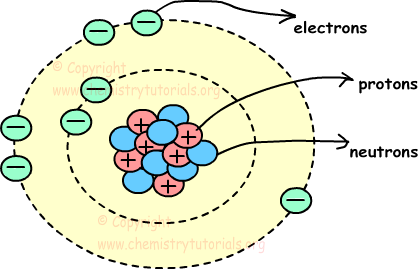 Picture given below shows, structure of atom and locations of proton neutron and electron in atom. Center of the atom, including protons and neutrons, is called also nucleus and circles around nucleus are called orbits. Mass of the neutron is approximately equal to the mass of proton. We neglect mass of electron since it is too small. Thus, mass of atom is equal to the sum of mass of protons and neutrons. We show mass number with letter "M". Mass number is not specific for each atom. Different atoms can have same mass number. Sodium and Magnesium are isotone atoms, their numbers of neutrons are equal. Since the protons number and neutrons number of atoms are different, their physical and chemical properties are also different. I. III. IV. and V is true for isotopes atoms. Example: Find the number of protons of atom having mass number 65 and neutron number 35. Mass number is equal to sum of protons and neutrons. Example: Which ones of the following statements are true for 1224X ands 1124Y atoms. Thus, I. II. and III. are true. To have same chemical properties, they must have equal numbers of protons and electrons. I. Both of them has same numbers of proton 26, but their electron numbers are different. First one has 26-2=24 electrons and second one has 26-3=23 electrons. Thus they have different chemical properties. II. Since both of them have different numbers of protons and electrons, they have different chemical properties. III. In this couple, they have equal number of protons and electrons they have same chemical properties.